Stanley Elevator Company’s service virtues are the backbone of our organization. Upgrade to greater reliability, comfort, efficiency, code compliance, and safety. Enjoy a level of personalized care and attention that our competitors can’t touch. With 24/7/365 unparalleled emergency repair plans, stay safe with Stanley. Our design and planning team is prepared to help customers through the entire elevator design and installation process, with decades of experience to ensure the best possible elevator solution. Every customer, every building and every elevator installation is unique, which is why we customize every proposal to our customers' specifications. Our expert technicians will take the time to speak to you and examine the unique specifications of the project to accurately scope, design and plan to deliver the best possible results. We'll ensure that the transition from design and planning to installation of a final product is seamless. We can modernize any make or model of equipment with the very latest in technology. 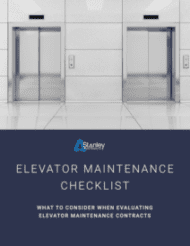 Choosing to modernize your elevator will provide greater reliability, comfort, efficiency, code compliance, and safety for your elevator passengers. Through our elevator modernization team, we can carefully assess the condition of your elevator by conducting a thorough field survey. Based on the results of this survey, we will recommend to retain, recondition, or replace equipment as circumstances warrant. Our team will approach your project with professionalism, expertise, and a high level of customer service. Our modernization team provides detailed specifications, proposals, layouts, and project management. We take great pride in guiding you through the process of upgrading your elevator and ultimately adding value to your building. Maintenance Plans backed by Stanley Signature Service Solutions are an investment in the performance and longevity of our system. An experienced elevator technician will actively seek out potential problems and perform ongoing repair work and upgrades during maintenance visits. This preventative approach to elevator service is what prevents large repairs and replacement of elevator parts, which ultimately saves our customers money and prevents lengthy breakdowns. Stanley Elevator Company will be your prompt and effective elevator repair partner. Stanley’s customer care center is ready to take your call 24 hours a day 365 days a year. We are operated solely by those with elevator industry experience ensuring quick, intelligent fixes to any problem. "Thank you and your folks for the effort down in Wells – Village Candle. It was a tremendous job to get an elevator constructed and installed in a very short time frame." "I just want to let you know how pleased we have been with the elevator work that has been going on at our building. I especially want to commend Steve and Ryan, they have both been great guys to work with and our residents just love them! They are hard working and polite and I know our residents will miss them when the job here is done." "I want to thank the Stanley team of players for a successful and early completion of the Building I Elevator Upgrade Project; for a job well done!!!" Stanley Elevator Company provides elevator installation, modernization, repair, and maintenance solutions for building owners, property managers, architects, contractors, builders and consultants throughout New England.